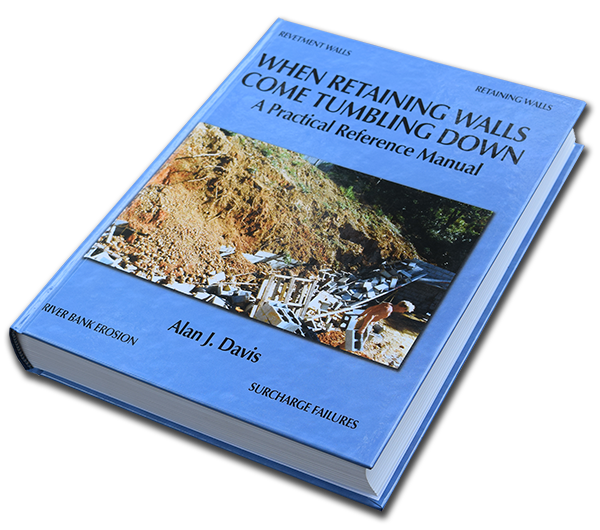 Alan Davis the author of the book “When Retaining Walls Come Tumbling DoWn” has been diagnosing and solving revetment and retaining wall problems in south-east Queensland and New South Wales for over 50 years, this book is the result of the meticulous descriptive, photographic and technical records he has kept over that period. The Coastal populations of many countries have grown rapidly in recent years — for reasons of lifestyle, environment and general afﬂuence — and with this growth, problems associatedwith coastal zone living have become more prominent. One such problem is the integrity of revetment and retaining walls at the land-water interface. Terrestrial retaining walls are not neglected in the text either: they share with coastal revetments many of the same causes of problems, for example excessive surcharge, leaching of backﬁll and foundation failure. Alan Davis , has used his knowledge well to produce a volume covering the gamut of revetment and retaining walls technology. Not only are the general forces, loads and defects common to revetment and retaining walls described, but also some seventy actual case studies with which the author has been associated are detailed. Hear what industry professionals have to say about this book.